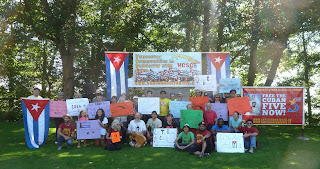 Back-to-Back Victories Against the U.S. Blockade on Cuba on the British Columbia, Canada/Washington State Border! Humanitarian Aid and Caravan Participants on Their Way to Cuba with the 24th Pastors for Peace Caravan to Cuba After 1.5 Hour Protest! 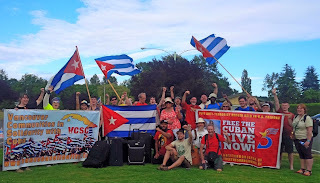 On July 14, 2013 humanitarian aid and Caravan to Cuba participants successfully crossed the British Columbia, Canada/Washington State border after a 1.5 hour-long protest! This is a great victory for the people all over the world fighting for an end to the U.S. blockade against Cuba, which for over 50 years has denied the people of Cuba access to basic items from medicines to school supplies. This successful action broke the U.S. blockade once again, building on the victory of last year's crossing with energetic chanting, marching and peoples unified expression of love for Cuba! In 2012 activists and peace-loving people from BC and Washington waged a 24-hour long protest, called “Occupy Border,” at the US/Canada border. This 24-hour long demonstration against the blockade won the passage of an entire truck-load of aid destined for Cuba on the 23rd Pastors for Peace Caravan. These back-to-back victories are a great example of people taking a stand for peace and justice and, in the words of the late founder of IFCO/Pastors for Peace, the Rev. Lucius Walker, Jr., “locking horns with the Empire,” and winning! 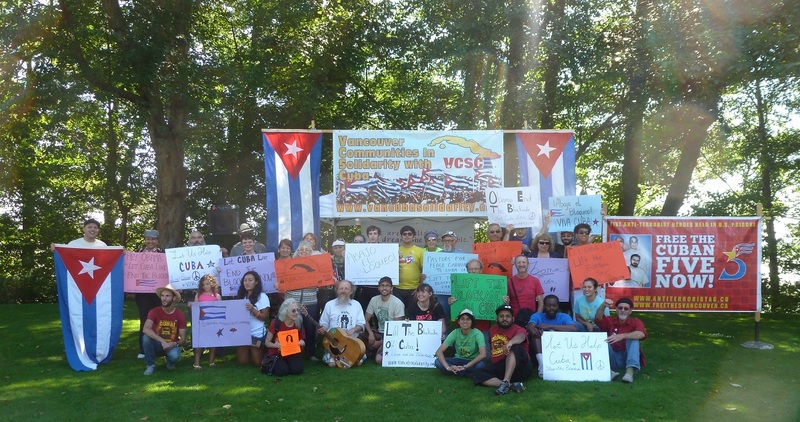 This day was also in honour of the late Tom Warner, a tireless social justice activist who was with the Caravans to Cuba from the very beginning, and a leading organizer with the Seattle-Cuba Friendship Committee. Not only is it a great victory that all the aid and Caravanistas are now on their way to Cuba, but the day of action was also an outreach and educational event for the hundreds of people passing through the border. 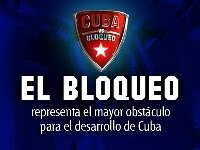 It was impossible to miss the chants of “Lift the Blockade on Cuba NOW!” “Hey Obama, Lift the Blockade!” “Abajo al Bloqueo!” “Free the Cuban 5 NOW!,” and supporters distributed hundreds of leaflets about the Caravan to Cuba and the Cuban 5 political prisoners held in U.S. jails. Although all of the aid was let through this year, it was not without harassment from the U.S. border officials. Their attempt to intimidate the Caravan supporters began as the 40-person strong march against the U.S. blockade on Cuba approached the border. U.S. border officials immediately came out to meet the march, insisting that the marching and chanting could not continue on. It was clear that they knew who was coming! The U.S. border authorities should have known that everyone who had marched down to the border was prepared to continue the protests until all the humanitarian aid and Caravanistas were allowed to pass. Instead, they attempted to silence a vigorous and loud protest happening just outside with further harassment through a close inspection of the humanitarian aid, which included pencils, Spanish language bibles, construction supplies and medicines. They wanted to tire the protesters out, but they only made them louder and the chants, singing and handing out information to drivers passing by did not stop for 1.5 hours straight! Before the successful crossing, the day began with a picnic meal and cultural program. Tamara Hansen, a Caravanista this year, as well as the Coordinator of Vancouver Communities in Solidarity with Cuba introduced an inspiring range of performers and supporters of Cuba including Hap Bockelie, a poet and leading organizer with the Seattle-Cuba Friendship Committee; Alison Bodine and Azza Rojbi, co-Coordinators of the Free the Cuban 5 Committee – Vancouver; Judy Zeh, leading organizer with the Seattle-Cuba Friendship Committee; Rejean, a Vancouver Island based musician; and Joose Justice, Vancouver hip-hop artist. This great victory would not have been possible without the unity and friendship between people in B.C., Canada and Washington State. Vancouver Communities in Solidarity with Cuba (VCSC - www.vancubasolidarity.com), the BC Aid Network for Cuba (BCANC - www.bcanc.org) and the Seattle-Cuba Friendship Committee (www.seattlecuba.org) joined together in organizing this year's border crossing, bringing people together for a picnic and protest action against the U.S. blockade.